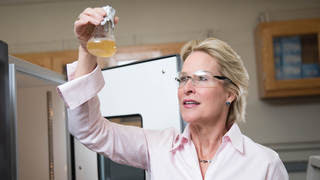 Click here to read about Frances Arnold's Nobel Prize. "What the heck does Mom want? Oh, Mom probably doesn't understand the time difference, she's in Dallas right now and is probably still thinking it's California time…maybe she just wants me to go check on her cats…" A litany of mundane explanations ran through James Bailey's bleary mind at 3:23 a.m. on October 3 when he was awakened from a deep sleep by three phone calls from his mother's cell number. Bailey silenced his phone for the first two, getting grumpier with each ring. Call #3 did the trick. He picked up the phone and said groggily, "What do you want?" With great excitement and maybe a tinge of impatience, his mother said, "I wish you had picked up your phone, but I just won the Nobel Prize." Bailey bolted upright, thrilled by the news and fueled by adrenaline. "I was overjoyed for her. It's fairly difficult to verbalize how I feel," he said. He never did manage to go back to sleep that night. In a few hours, he'd be able to share the news with his colleagues when he arrived at his job at NASA's Jet Propulsion Laboratory in Building 179, High Bay 1 -- the clean room where he is a flight technician working on Mars 2020. Bailey's mother is Frances Arnold, the Linus Pauling Professor of Chemical Engineering at Caltech, which manages JPL for NASA. Her 2018 Nobel Prize in Chemistry honors her pioneering work in creating new, improved enzymes in the laboratory using the principles of evolution. Arnold shares the prize with two other scientists. Arnold's bio has an abundance of academic milestones and stellar awards. She was the first woman to receive the 2011 Charles Stark Draper Prize from the National Academy of Engineering. She is also the first woman and one of just a few individuals elected to all three branches of the National Academies: for Medicine, Sciences and Engineering. Bailey traveled a different path than his mother to his job at JPL. Growing up in Pasadena, he didn't thrive in conventional schools, so he pursued vocational training in welding and machining. After high school, he worked on high-performance cars at a local shop. At 20, he joined the Army, where he was trained as a Blackhawk helicopter mechanic and became part of a flight crew. After wrapping up six years of military service, including crucial work on medical evacuation helicopter teams in Afghanistan, he learned JPL was looking for people with an aviation background to work as flight technicians. Bailey fit the bill, and he was hired.